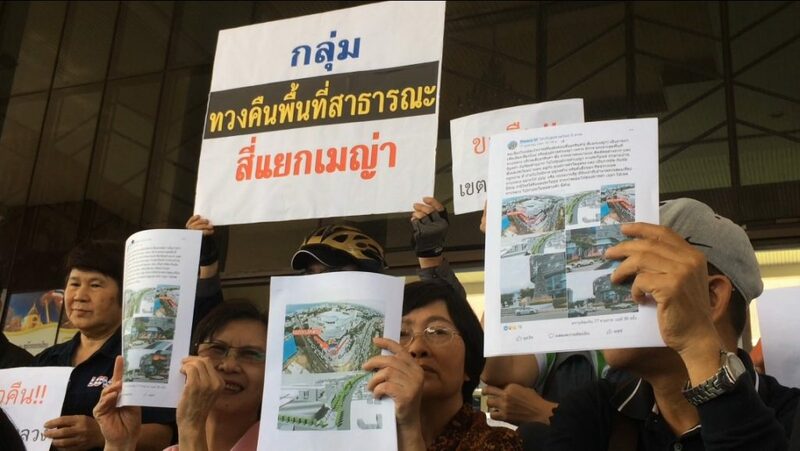 CityNews – An official letter was sent to the Prime Minister’s office, signed by many Chiang Mai citizens and members of academia asking for transparency concerning the land on the corner between Huay Kaew Road and the Superhighway. The letter also requested the disputed 1,500 square meter land be returned to the public. On 22nd January 2019, at Chiang Mai City Hall, Assoc. Prof. Theera Visitpanich and a group of supporters sent the official letter which had 500 signatures attached, asking for a full investigation into the Department of Highway which has been accused of allowing Maya Lifestyle Mall to build a fountain and activities space on land which extends to public land owned by the Highway Department. The letter was sent to Prime Minister General Prayut Chan-o-cha, via Chiang Mai’s governor and Damrong Tham Centre, as well as the National Anti-Corruption Commission. According to the letter, the group asked for a full investigation into the government official who allowed the private mall to build the fountain, trespassing on highway land. they also asked to see all related documents involved in this permission. They have asked the Highway Department to immediately return the land to the public to be used to expand the road, bike lane and footpath.